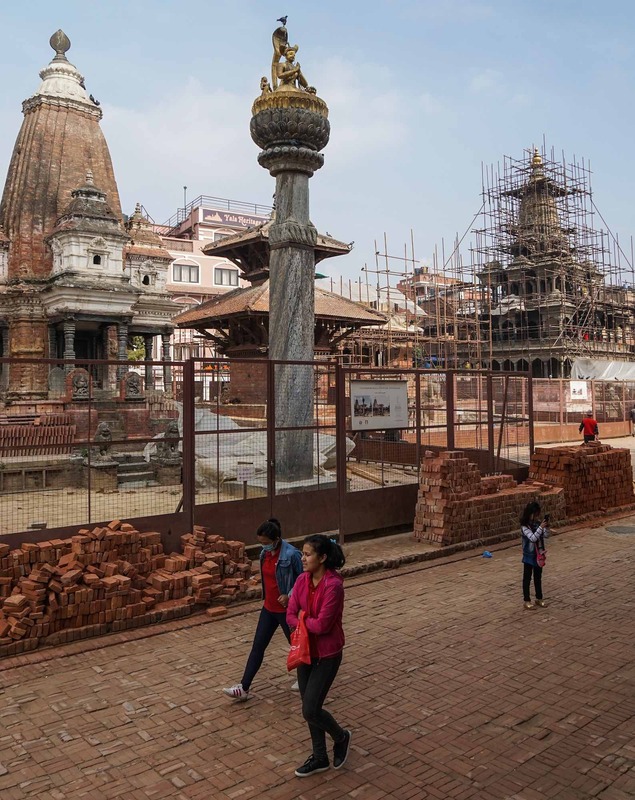 Patan’s Durbar Square suffered significant damage in the April 2015 Gorkha Earthquakes. The post linked above shows what it looked like before and immediately after the earth stopped shaking. In April 2018 I paid a return visit to the town. The last time (November 2006) I had spent half my time there looking – obsessing? 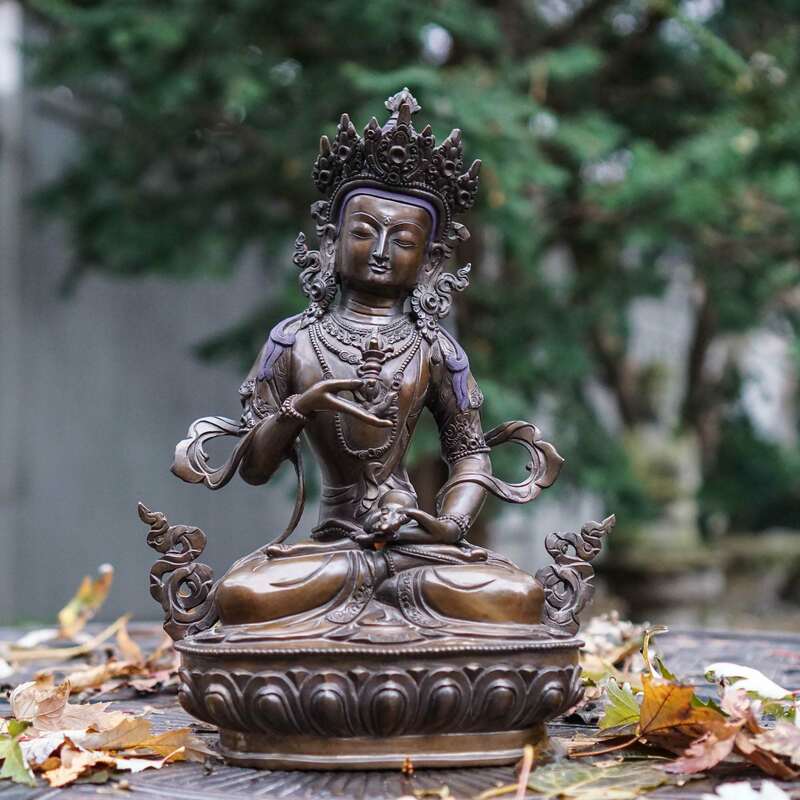 – for that perfect Buddha statue! 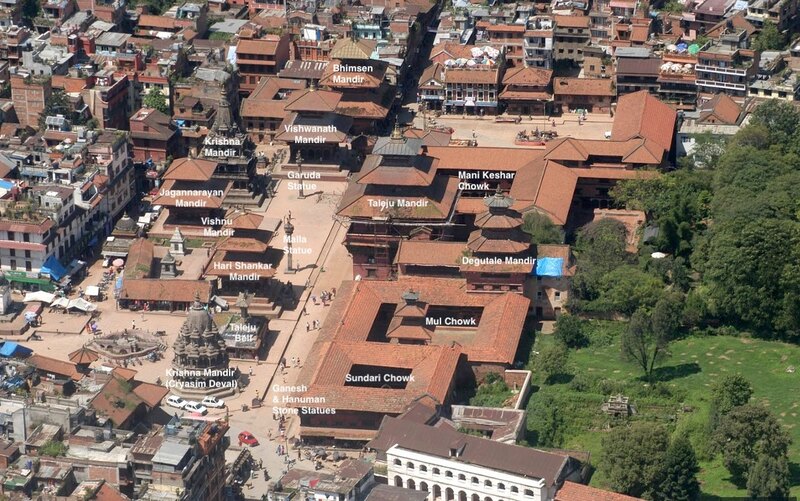 This time I just focussed on documenting the state of the square and the nearby streets and temples to the north. 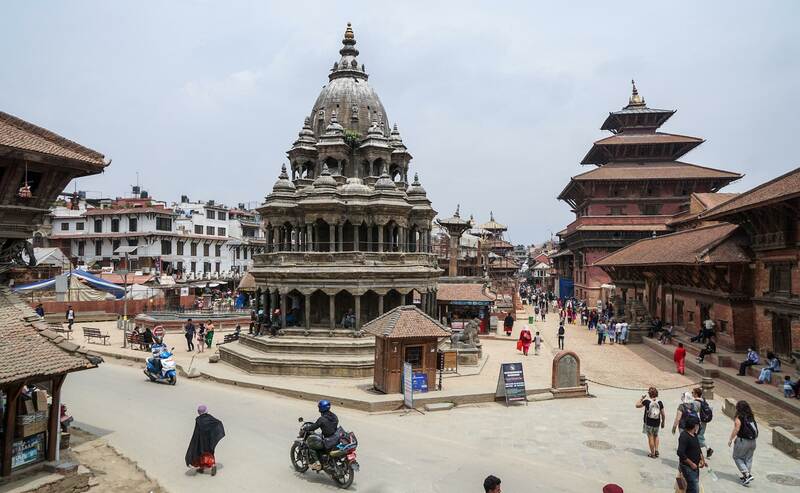 Patan’s Durbar Square is a compact and small space compared to Kathmandu’s sprawling version, even if it has the same 1000 NPR entrance fee. It is certainly much easier to manage! 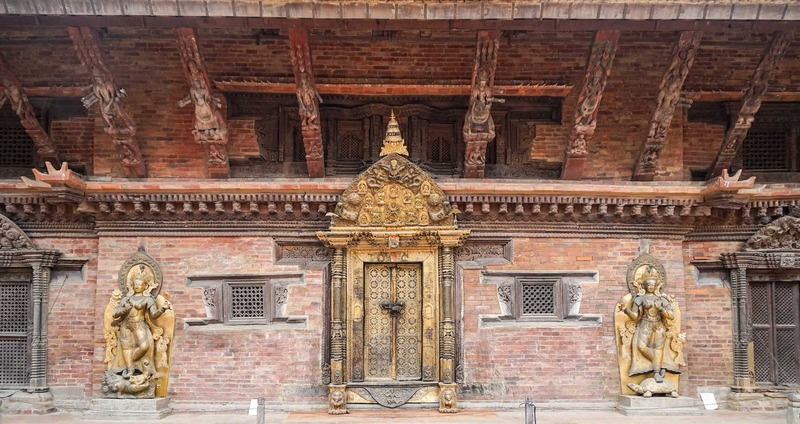 On the west side are a half-dozen temples; the Royal Palace complex faces the temples on the square’s east side. The image below – an aerial shot taken from the south – shows what it looked like before the 2015 quakes. And just below is a shot I took in 2006 from a rooftop café on the south end of the square. It no longer looks quite like this. 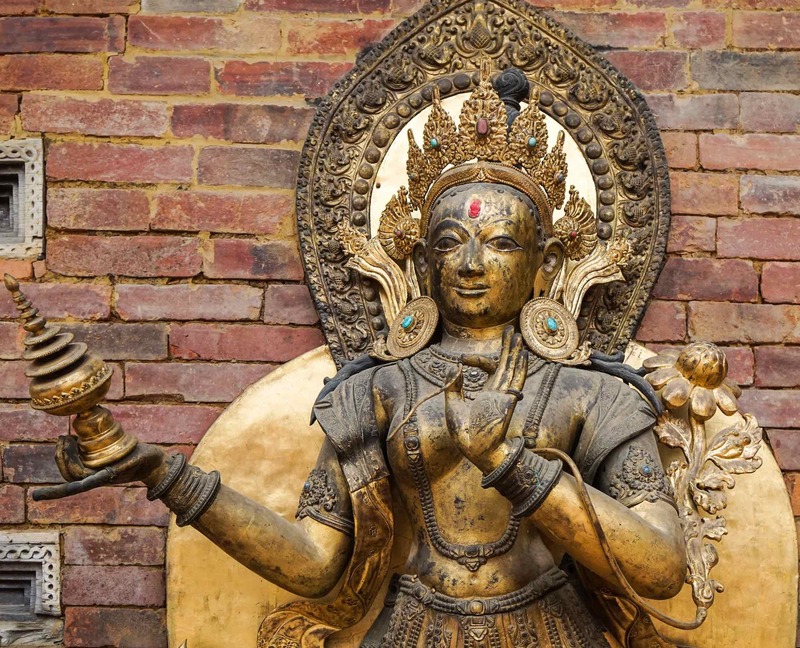 A couple of temples have collapsed completely and others have suffered significant structural damage. 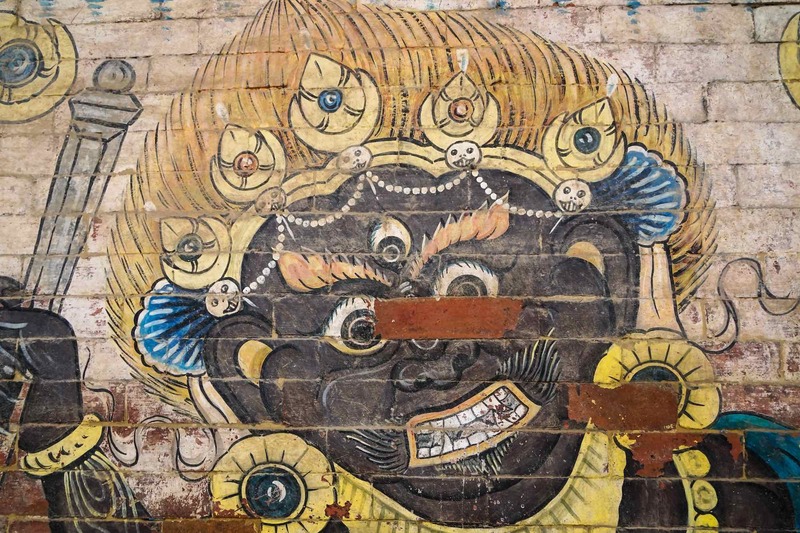 One temple which survived without damage was the Krishna Temple (Chyasim Deval). 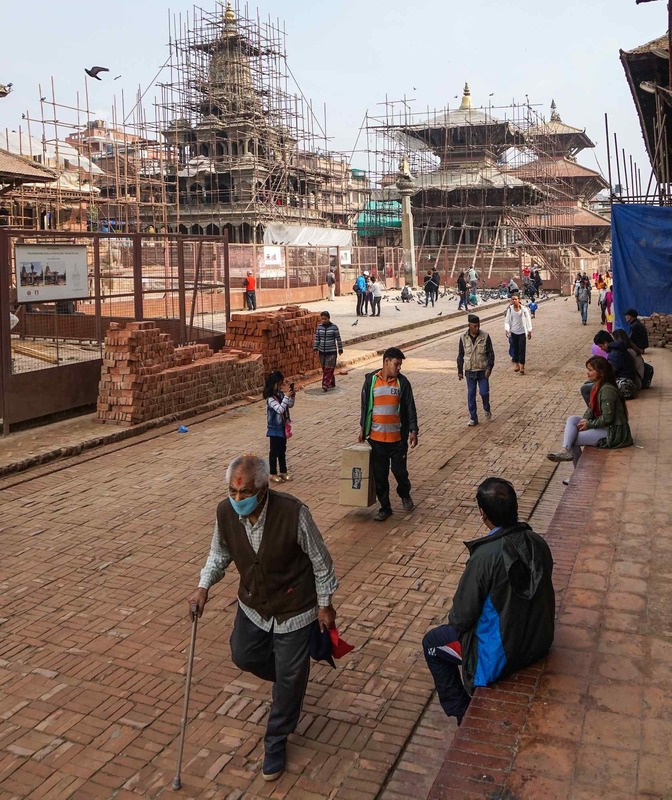 It will be where most tourists begin their Durbar Square visit. 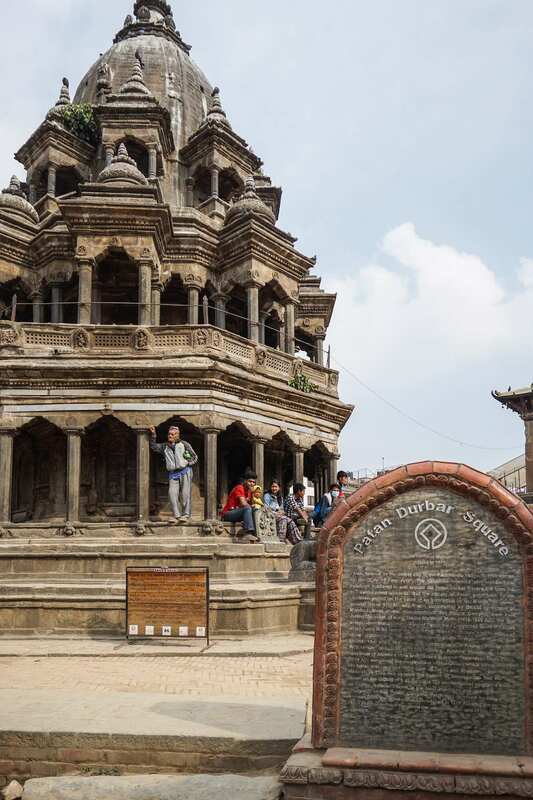 Since 2006, the Patan tourism officials have put the ticket booth in front of it. From the ground level perspective of the shot below, all looks the same in 2018. 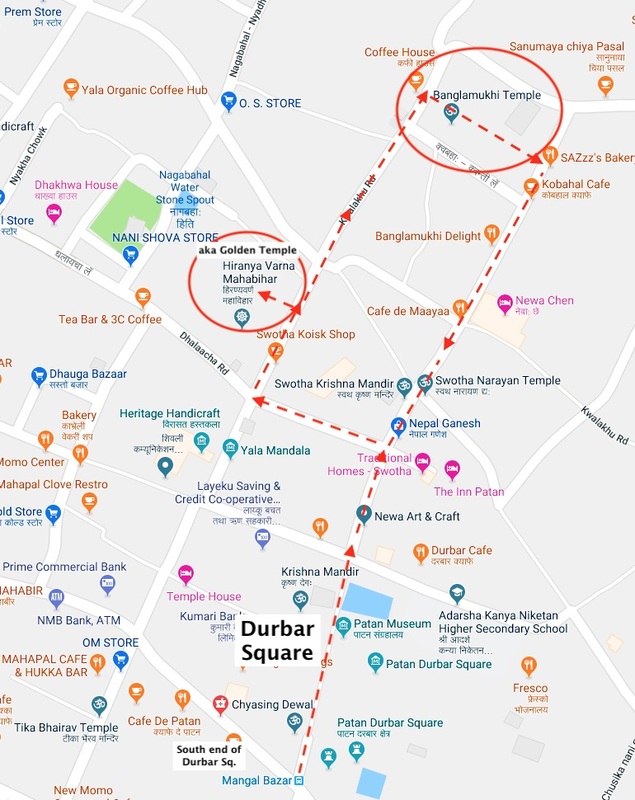 I took a few shots of the octogonal-shaped temple (mandir) dedicated to Krishna and slowly made my way to the other end. 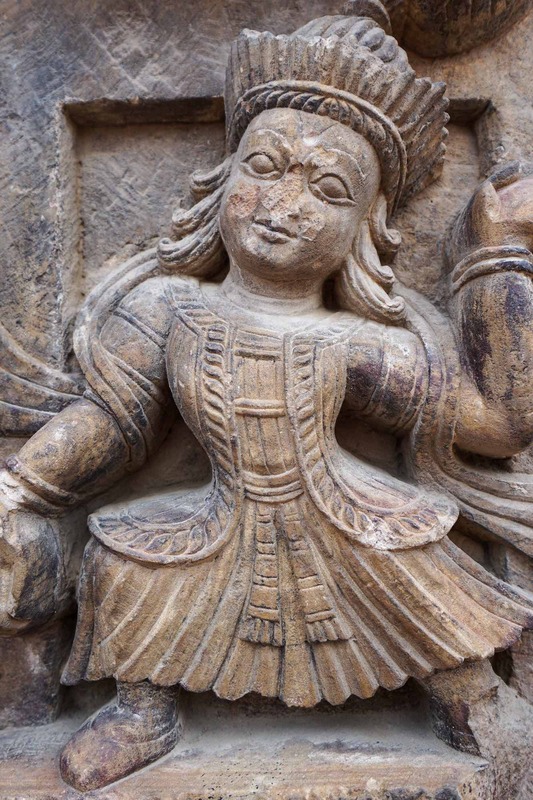 As for the Krishna Mandir, it was built in the 1630’s thanks to the king’s belief that he had seen the god and his consort Radha standing at that very spot one evening. 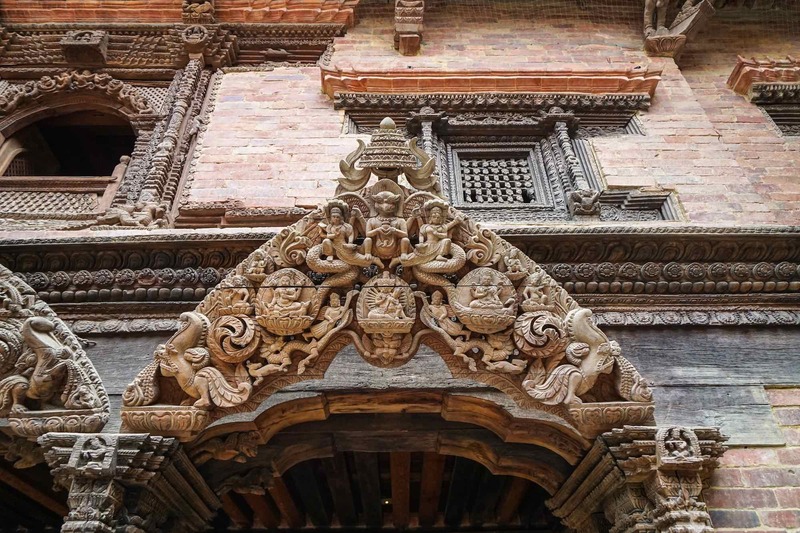 Given its location, these days it is a popular spot for tourists and locals to sit and watch Patan walk by. Even the ones that remained standing are surrounded by scaffolding and fences. 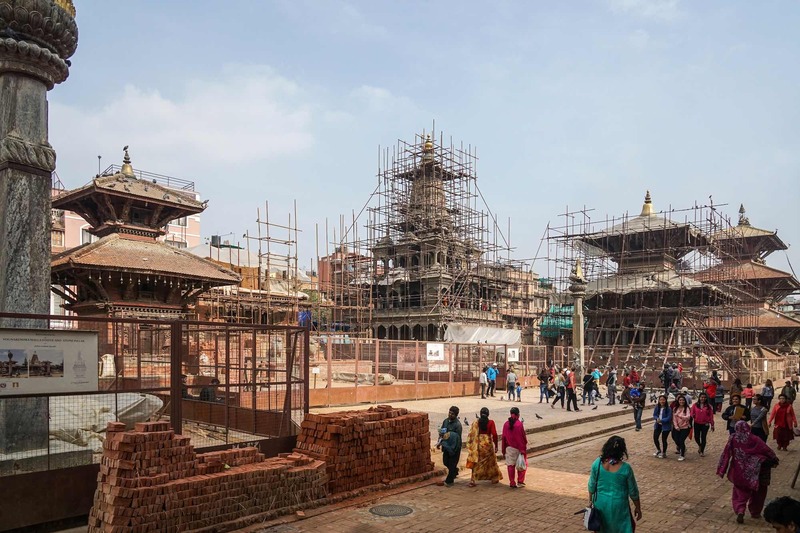 Durbar Square Patan May 2018 – scaffolding everywhere! 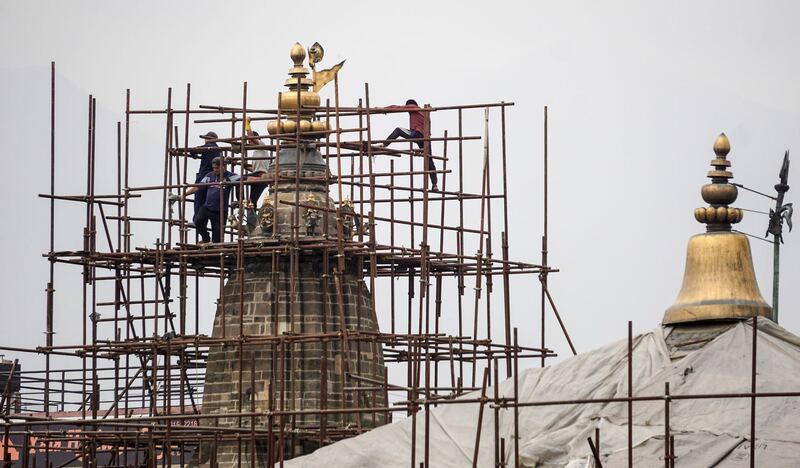 The Yoganarendra Malla column with the statue on top, which collapsed in 2015, has been put back up and work is proceeding on the Hari Shankar Mandir. 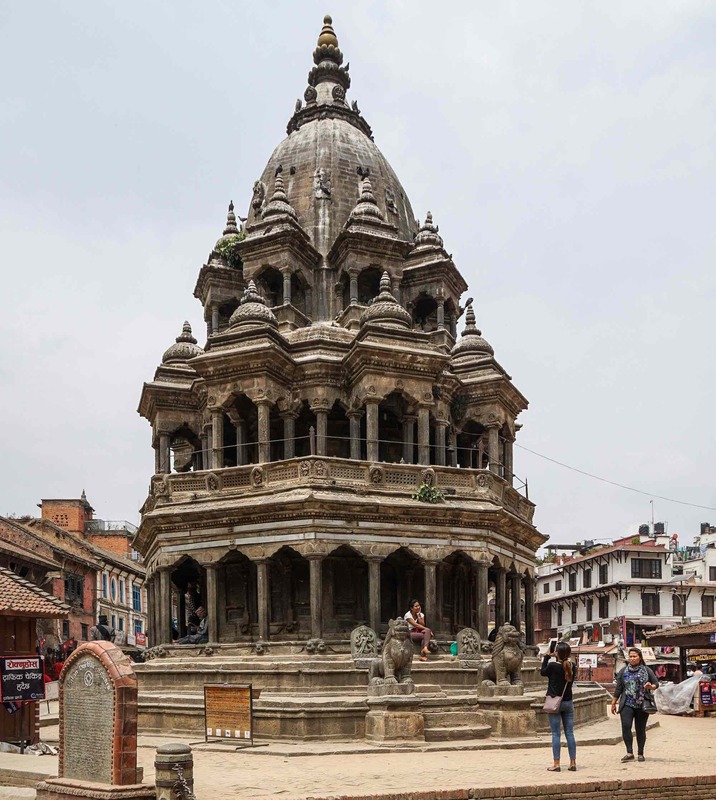 The architectural jewel of the square – and a living temple for the Newari Hindu community – is the Krishna Temple at the north end of the square. In the images above and below it is the temple with the scaffolding going up to the top. Every once in a while I looked up to the top of the temple in amazement as workers scampered about without harnesses and rope on the metal pipe rigging (an upgrade from the traditional bamboo) in their flip-flops! 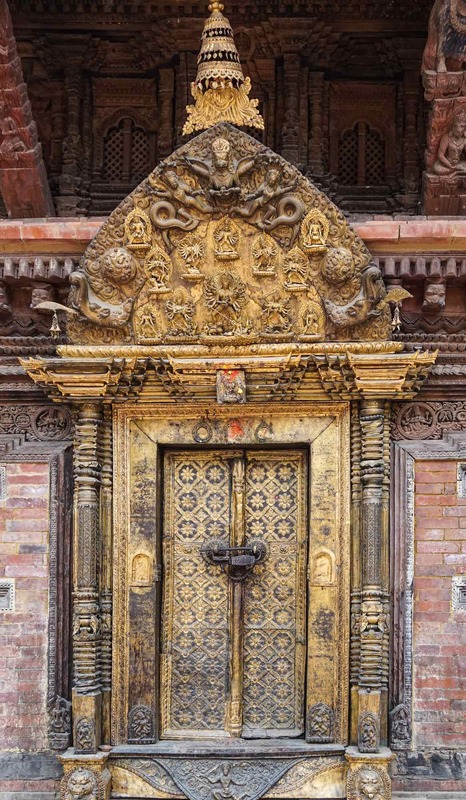 On the Royal Palace side of the Square, photogenic doorways, statues, paintings, and strut work had me framing image after image as I walked north towards the Bhimsen Mandir. 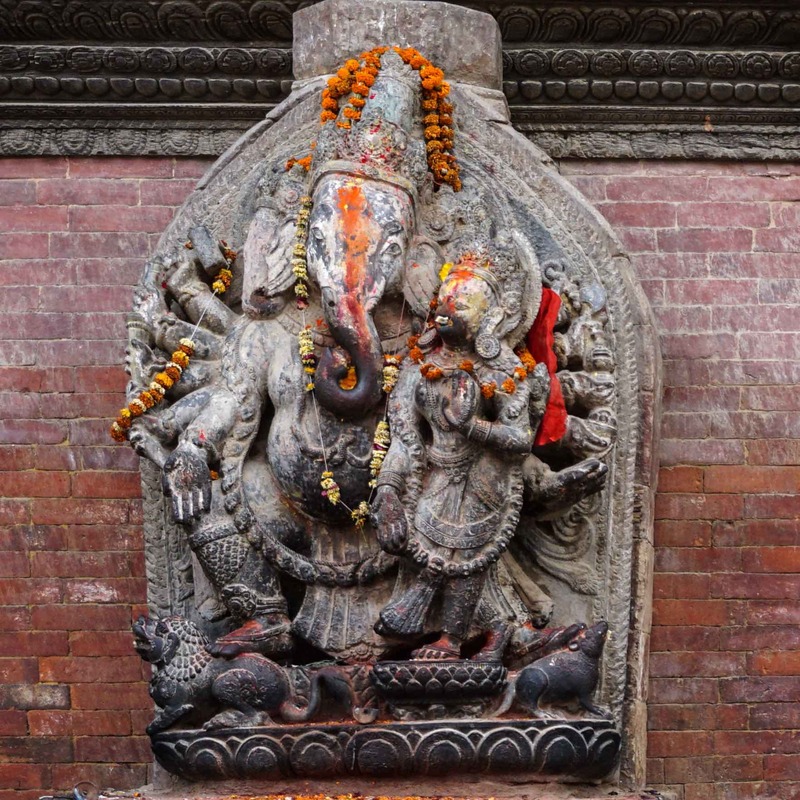 The Bhimsen Mandir marks the north end of the square. 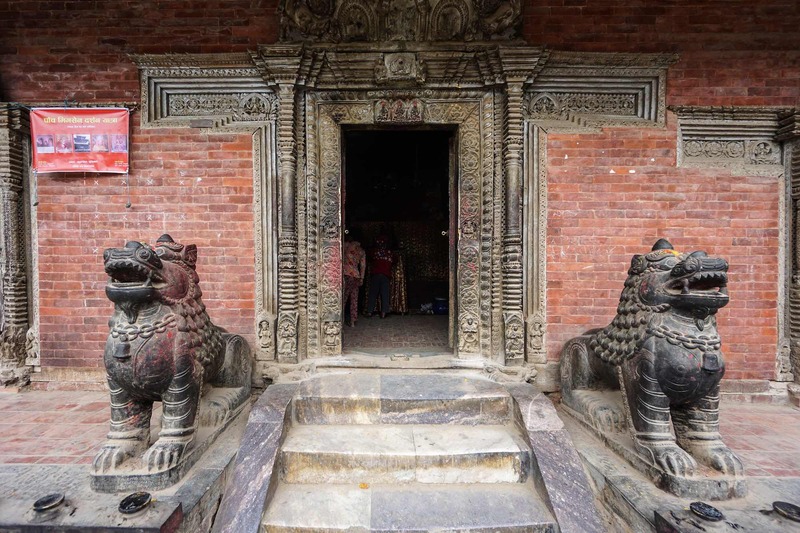 At its entrance two stone lions keep guard. 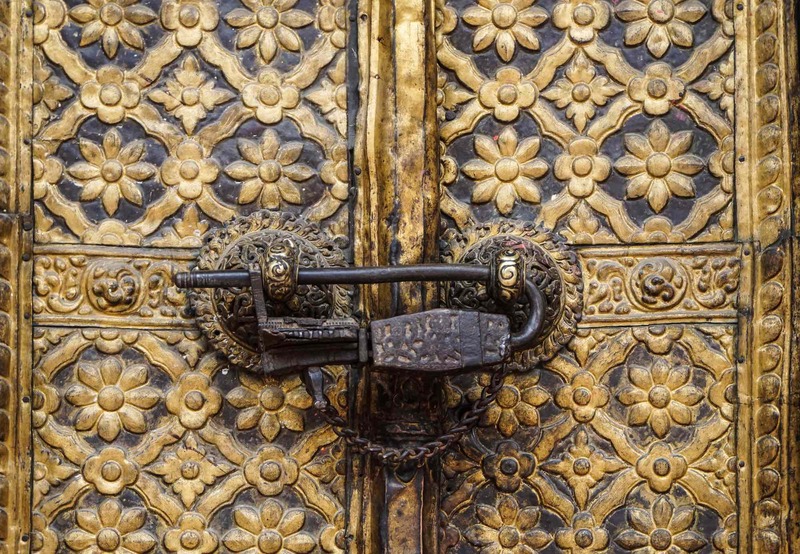 Non-Hindus are not allowed entry! 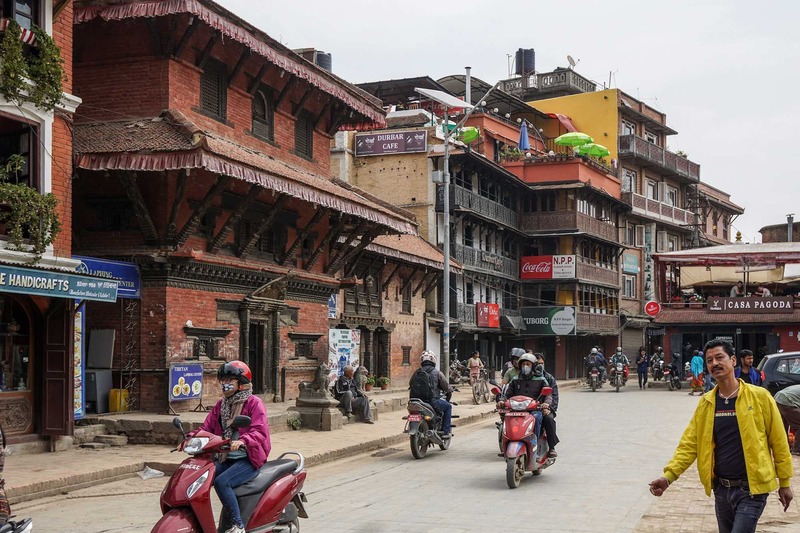 Just across from the Bhimsen Temple is a rooftop café from which I got the following shot of the square. 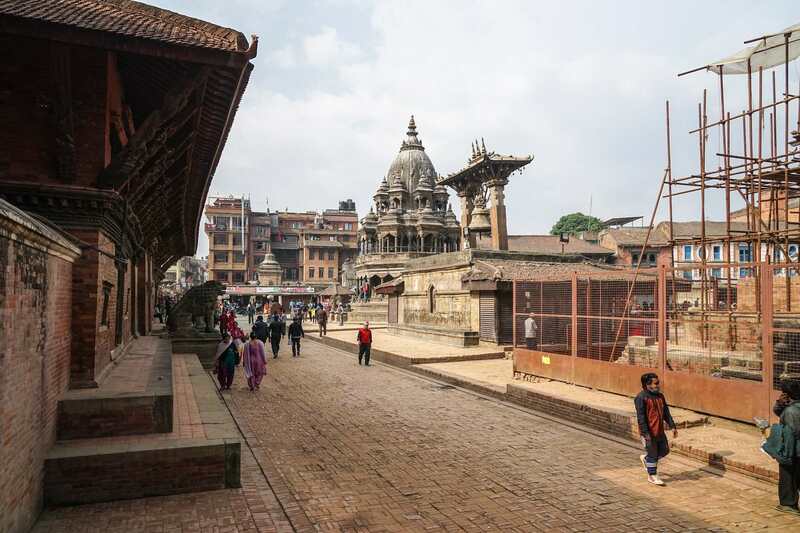 Visible from left to right are the Royal Palace’s Taleju Temple, the top of the scaffolded Krishna Temple, the Vishwanath Temple, and the Bhimsen Temple on the right. In the foreground, the brick-lined sunken water tank is the Manga Hiti. 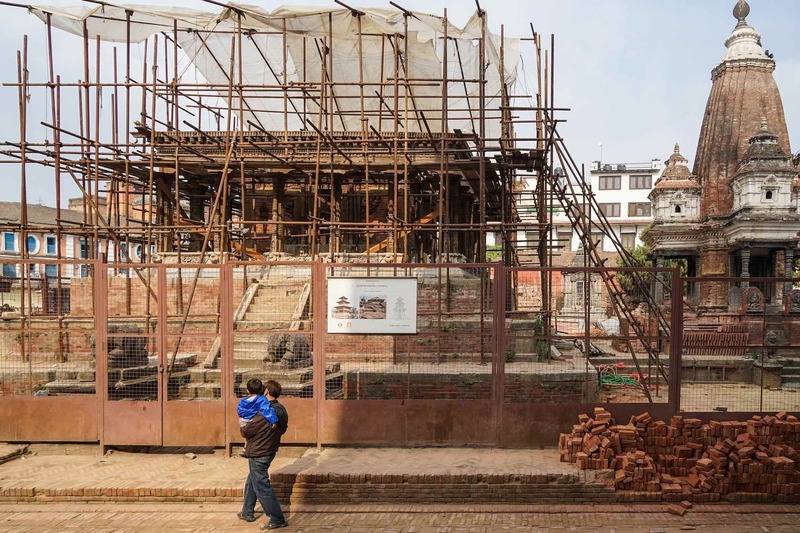 The two wooden pavilions between the water tank and the square – the Mani Mandap – collapsed in 2015 and were being rebuilt in early 2018. A look back at the restaurant on the fifth floor of the building you see in the image below and then it was on to the Royal Palace. Of the various sections of the Royal Palace, the two I focussed on were Mul Chowk and Sundari Chowk. 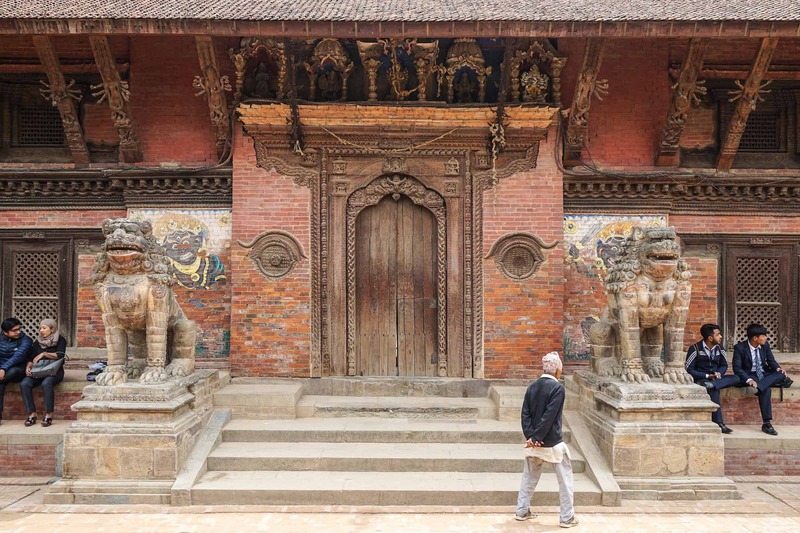 They are located at the south end of the Royal Palace and was where the royal family lived until the dynasty came to an end with the arrival of the Gorkha army in 1769. 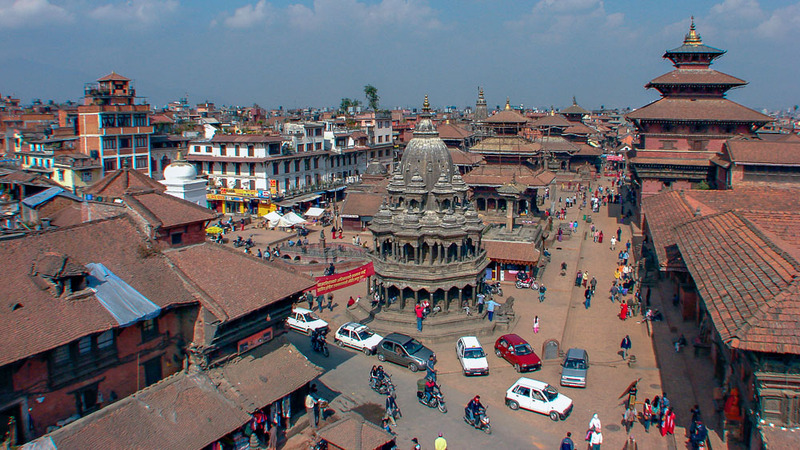 That year would also be the end of Patan as the capital of a small independent kingdom in the Kathmandu Valley. 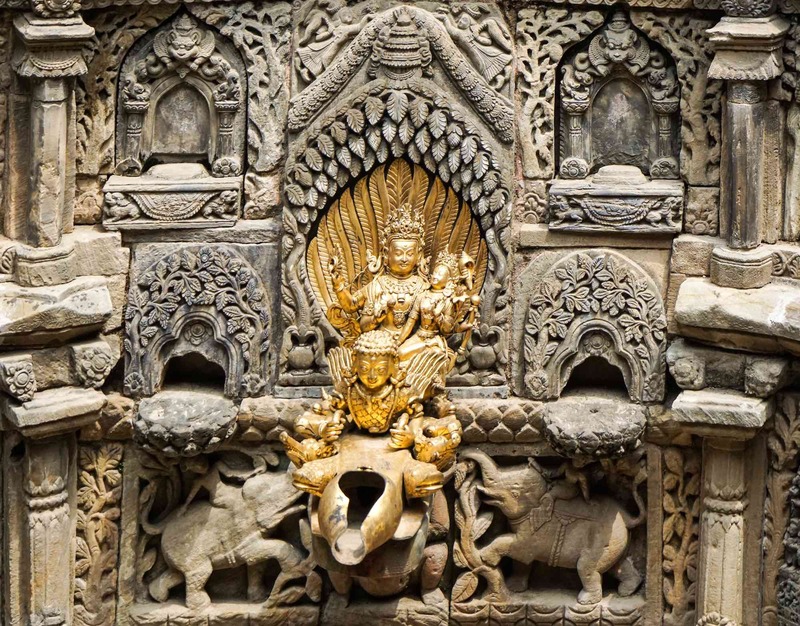 Flanking the elaborate doorway are statues of two Hindu goddesses, with Jamuna on the left and Ganga on the right. 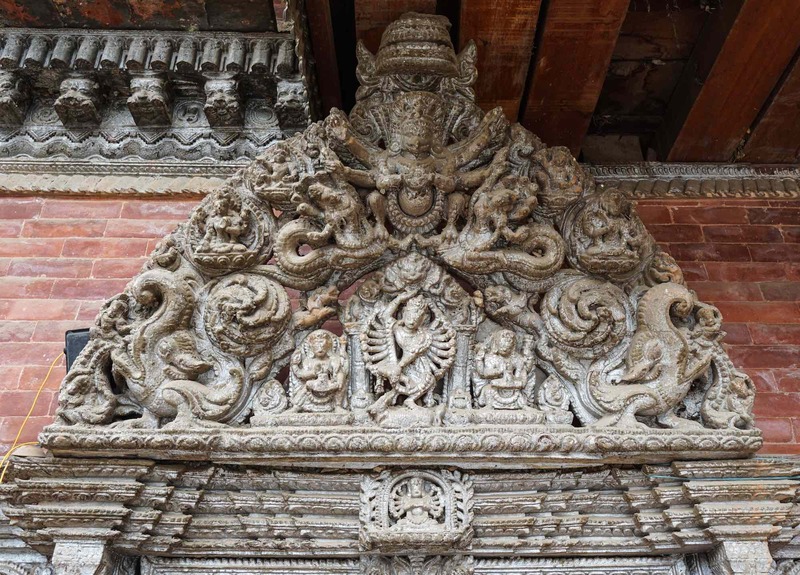 In Sundari Chowk, there is more elaborate stone and woodwork. 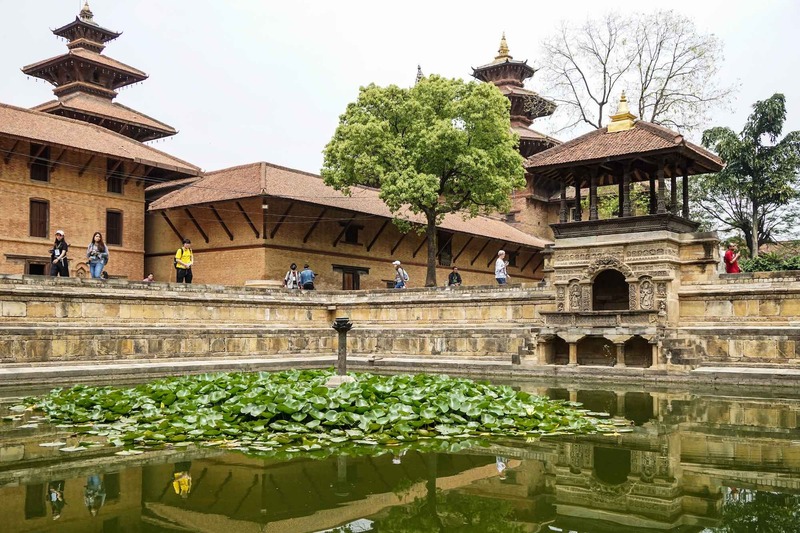 The Tusha Hiti a sunken fountain dating back to the time of King Siddhi Narsingh Malla in 1647. Behind Sundari Chowk is Bhandarkhal Garden with the pool of water you see below. In the background, the tops of two of the Royal Palace’s temples – the Degu Talle and the Taleju Mandir – can be seen. 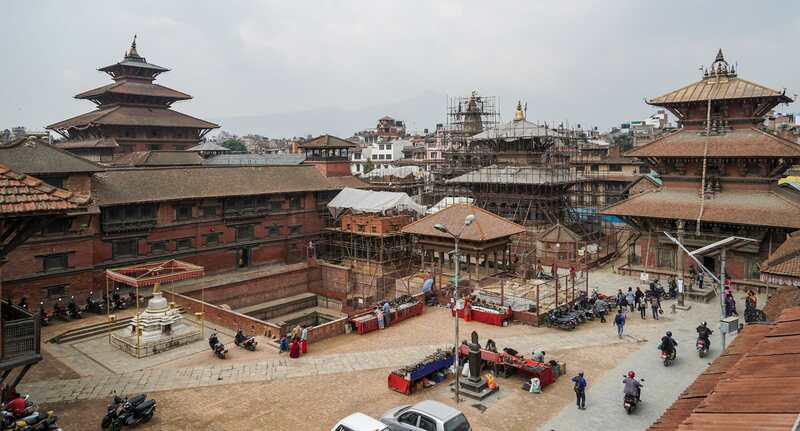 Parts of the Palace complex were roped off in early 2018 while work continued in its restoration. 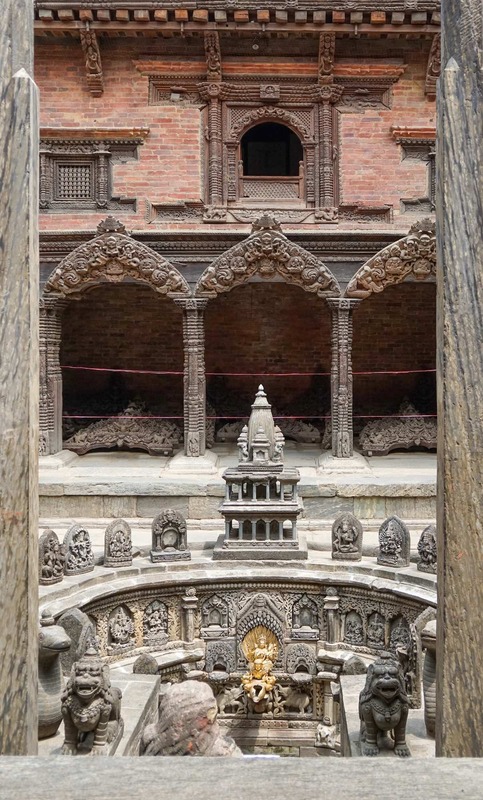 I took a brief coffee break before continuing with my Patan tour. 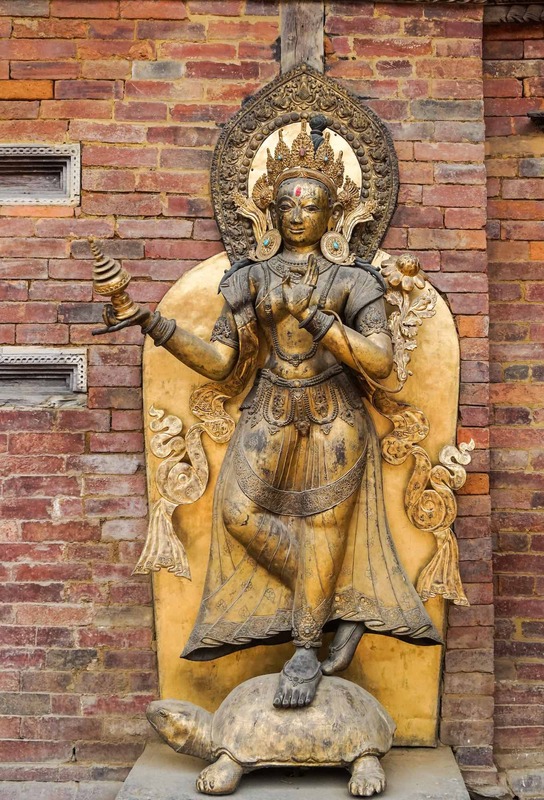 I was headed north of the square to a Buddhist monastery/temple complex known as the Golden Temple; I also wanted to visit the Hindu Banglamukti Temple. 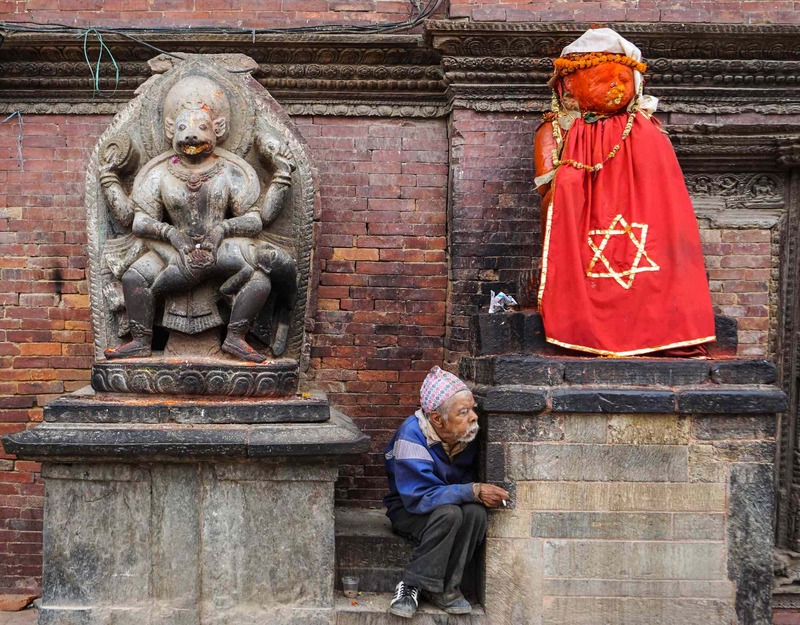 This entry was posted in Cultural Focus, Nepal. Bookmark the permalink.